SALT LAKE CITY, UT, Feb. 27, 2019 – Forget crystal balls. The snow says it all. 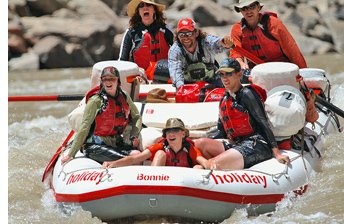 For over half a century Holiday River Expeditions has looked to the mountains to forecast upcoming rafting seasons. Winter snows turn into spring runoff. 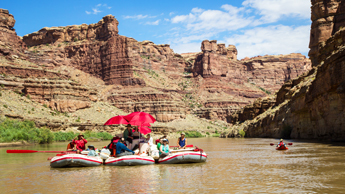 Thus far, a stormy and snow-packed winter in the Rockies predicts a robust 2019 rafting season in the mountain and desert southwest. “We’re expecting to have a lot of fun in 2019, thanks to Mother Nature and year-to-date bookings that are up 10 percent over the same time last year,” said Holiday River Expeditions’ longtime sales manager and spokeswoman Karen Johnson. Higher river flows mean that guests on all of Holiday’s rafting trips will have more off-river time to hike, enjoy the beach, relax or explore the side canyons from camp and enroute between camps. 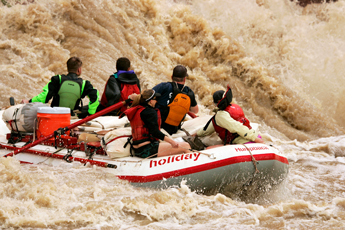 “Plus high water gives our guests an Adrenaline-rush and thrill in a carefully secured, calculated manner,” Johnson added. As of today, snow pack affecting the Colorado River Basin is running 116 percent of the February 27th average, a good sign for the upcoming rafting season on the Colorado, Yampa and Green rivers. 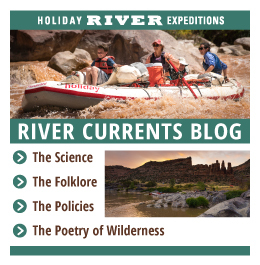 Among Holiday River Expeditions’ whitewater rafting trips most affected by high runoff are those on the Yampa River in the heart of Dinosaur National Monument. This undammed, free-flowing river benefits greatly from unfettered spring runoff that also makes its way to Desolation Canyon (on the Green River) and Cataract Canyon (after confluence with the Colorado River). 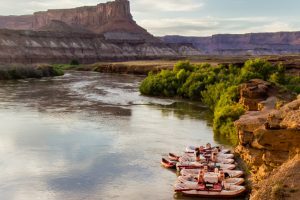 Other rafting trips influenced by abundant snow pack are those on the Colorado River in both Westwater Canyon and further along in Cataract Canyon cutting through the heart of Canyonlands National Park. One fact, worthy of note, helps set Holiday apart from most other operators on the river. They are the only rafting outfitter that literally goes with the flow exclusively on all trips by running these rivers by oar-power only, without motorized rafts or motorized support. “Oar-power is the most natural way to experience the river and the absence of motors makes high water trips as exciting as it gets. Rafters experience the rush of wind, a chatty raven or a churning rapid absent the drone and smell of a motorized raft,” said Tim Gaylord, Director of Operations and Holiday guide since 1978. Even in high water, when other companies call on motorized boats to stay the course, Holiday instead employs triple rigs, usually from late May to early July in Cataract Canyon when water levels get above 25-30,000 CFS and higher. The rigs are three 18-foot rafts lashed side by side to form one larger raft. 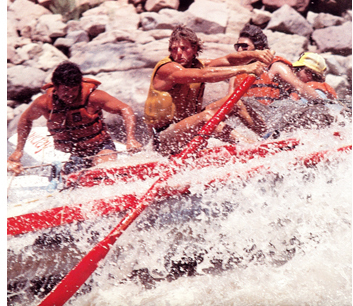 It is maneuvered by two guides, sweep-style, each using one oar. “These rafts are incredibly stable and the rigging allows them to flex in many ways. They allow us to continue to use only oar-powered rafts in even the highest water,” noted Gaylord.